Touch! 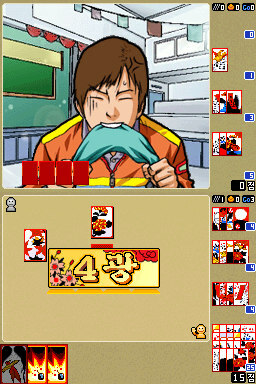 Gostop DS is a handheld version of the popular Korean card game Gostop, developed and published by CTGAME Entertainment in 2008. In this run, perfectacle carefully manipulates luck to beat every ranked opponent as quickly as possible. For each opponent, a minimum amount of points must be obtained before being able to move on to the next one. Clever strategy and use of auto-wins are also used to rack up multipliers and obtain extravagant high scores in a remarkably short period.